“You must remember this, a kiss is just a kiss…” Except for when it comes to a first kiss. As all lovers will tell you, the magic in a relationship sparks or fizzles with that first kiss. It is a dealmaker or breaker. When a first kiss burns hot, love blooms. According to a 2012 ABC Science poll, 90% of lovers, irrespective of age, can remember when and where their first kiss occurred. When a first kiss goes badly—as 60% of first kisses do according to the same poll—all hopes for a lasting romance are lost. I was ten years-old the first time I fantasized about holding a boy’s hand—a very specific boy with blond hair parted by a cowlick on the right side of his forehead, tiny freckles dotting his perfectly upturned nose, and grey-blue eyes that reminded me of the sky before a summer storm. I daydreamed about walking past him one day and letting my hand brush his. In my daydream, he would take my hand and we’d stand there together. That was as far as my ten-year-old mind had worked things out. Having accomplished my goal, I supposed we’d just stand there holding hands for eternity. I wanted it so badly. When I was twelve years-old, that same boy—who was by then fourteen and over six-feet tall, gave me my first kiss. As we sat together in a wooden porch swing, he reached out to lift a strand of hair that the gathering wind had blown into my face, and as he leaned in to tuck the hair behind my ear, he kissed me. “I want to remember you just like this,” he said, “with the wind and that strand of hair in your face, always. You’re perfect.” I could have died! It was the most romantic moment of my life. At twenty-seven, I married that boy even though he hadn’t said anything half as sweet to me since that long-ago summer. It was the kiss that did it. I'd never forgotten it. 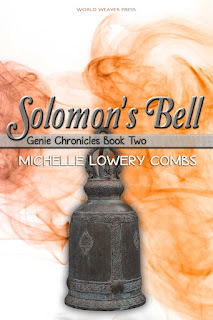 In Solomon’s Bell, the second installment of the Genie Chronicles, thirteen-year-old main character Ginn Lawson contemplates bartering her first kiss for what she hopes is information she needs to save her family. Caleb Scott, an older boy and Ginn’s longtime crush, is a descendant of Grimms, members of the Order of the Grimoire, who’ll stop at nothing to possess a genie as part of their magical menagerie. Caleb turns from the Order in hopes of proving his devotion to Ginn, but when Ginn asks Caleb to return to his Grimm roots to help save her family from the clutches of a golem, Caleb has but one request: a kiss. Ginn agrees, only to worry later that it’s been bad luck to barter her first kiss for intel on her most dangerous enemy. As the story progresses and Ginn is swept up in the adventure of battling golems both at home and in 16th Century Prague, she forgets about the promised kiss; but that’s never the case for Caleb. Will their romance burn bright or is Caleb’s past and their new mission too dark to let in the light? What do you remember about your first kiss? I'd love to hear about it in the comments.